"Mobile Tours Made Easy ..."
It is hard to miss the fundamental shift underway in the way people get information, communicate with each other and access entertainment content driven by the power of Mobile Smartphone technology. Today, over half of the visitors walking into your institution have a Smartphone in their pocket and this trend is accelerating. They are accustomed to downloading applications and content and searching for information through the Smartphone wherever and whenever they want. Your institution needs to take advantage of this new way of interacting with the world! You have almost certainly considered the importance and value of reaching out to iPhone and Android Smartphone equipped visitors. However, until today, developing a professional tour app from scratch was challenging and time consuming (especially if app development is not a core function of your organization) and outsourcing Smartphone app development to a 3rd party consultant is pricey, takes a long time and is hard to maintain. Spatial Adventures recognizes your need for a simple, inexpensive and powerful solution for creating branded iPhone and Android tour apps and the Spatial Smartphone TourApp Service has been specifically designed to address your need. 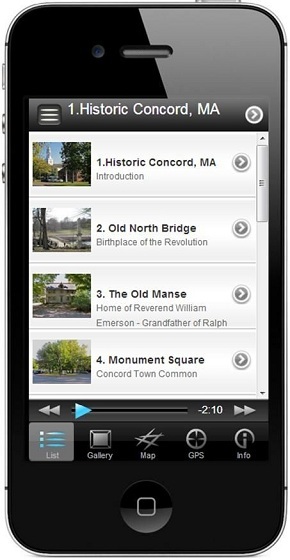 Rich combination of Audio, Images and Text to tell the story of your Exhibit, Museum, Walking Tour, etc. Click App Store badge to download an example TourApp for the iPhone called ("The Historic Concord, MA Tour") or click Google Play badge to download the Andorid version. Create an account on the Spatial AppBuilder web-portal (the URL and Sign Up process is found in the Guide to AppBuilder).